I’m on the road today, visiting with the Patient Revolution team, so I’m looking back at a post from the past. But it’s not just any post … it’s a grost. (A gross post.) 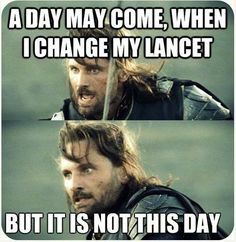 How often do you change your lancet? I will admit that I don’t do it as often as I should, but I’ve been really trying to do it more regularly. In efforts to keep my fingertips from hating me. Every single time there’s a new meme about changing the lancet in a finger pricker device (nope, that is not the technical term), I laugh because they are all true in that “whoops” sort of way. Upstairs in the bathroom closet, I have boxes and boxes of lancets for all kinds of different poker devices (again, not the technical term). All different sizes and shapes and gauges … years and years worth of lancets for half a dozen different devices. (Except The Guillotine. That thing was retired decades ago, thank goodness.) And the reason I have so many lancets stashed? I went years without regularly changing my lancet. Gross. I know. And I’ve seen that photo of what a needle looks like before use, after one use, and after six uses and yes, it grosses me right the hell out. But for a long, long time, I changed my lancet once a month. Maybe once a week, depending. And I only changed it if it didn’t procure a good blood droplet or if it went into my fingertip and got “stuck.” (You know what I mean … when you press the button and the lancet deploys, only it lodges itself into your fingertip and has a weird suction feeling when it pulls out? Horribly horrible.) Lancet swapping-out was a shameful non-priority for a long time. ONE. A friend told me about how she’d heard a story about a person with diabetes whose fingertips were downright gangrenous because they didn’t change their lancet. “Ew, really?” “Really.” And even though I stand firmly on the “hope vs. fear” motivation concept, this story about mostly-dead fingertips made me want to throw up. Then I started searching the Internet for information on needle reuse and the photos made me want to apologize profusely to all my digits. I had no idea how nasty and serrated the needle edges became after just one use. I thought about all the times I had injected syringes through my jeans in high school. I thought about how a box of lancets could last me two years. I thought about how gross I was. Gross, gross, groooooosssssss. TWO. And then I explored lancing device options. I had heard really good things about the Accu-Chek Multiclix (mostly from Sara, because she frigging loves hers), and the device was snazzy because it comes with a drum of lancets that automagically swap out, but the size of the thing was too big for the case I kept my meter in. Switching to the One Touch Delica was the winner, for me, because the lancet gauge is so thin that I’m forced to change it regularly because otherwise, I don’t bleed. (It becomes that dance of pull back the device, press the button, nothing happens, repeat 10x, change lancet and curse.) Like it or not, I have to change my lancet regularly or the device becomes useless. Now I change my lancet once a day. Every day. And every time I kill a box of lancets, I feel accomplished because in the last four years, I’ve gone through at least two dozen boxes. In the 20+ years prior? Probably the same number of lancet boxes. How Often Should I Change My Lancet? (A “Grost.) Change Your Lancet. Guest Post: The One Diabetes Rule I Always Follow. D-Blog Week: Change One Life, Change the World. I change it when it hurts. Since I test at least 8 X each dy (no CGM, yet) it can be once a week, sometime much longer. I have a stockpile of lancets that should be enough to last at least one lifetime. I am all over the multiclix or newer fasclix. I now change mine 19 out of 20 times. Ditto what Janis said. I still have lancets from 1999 in my stash 🙂 The Guillotine was the Thing of Evil for me as well! Guilty as charged!!!! I’m relatively “NEW” to this dance yet I picked up this one bad habit from the get go!! I’m not even sure when I realized almost everyone else was as bad as me in this dept. As always, thanks for sharing!! HUGS!!!! I use FastClix from Accu-Chek. It is so convenient, it has 6 lancets in one, that I just turn the nob each time (6 times) until it runs out. Every stick is a new needle, and every 6 sticks, I change it out. Could be 1 day or 3-4 days (depending on how amazing my CGM is =).